What's This New "People" Icon in My Taskbar? - Ask Leo! What’s This New “People” Icon in My Taskbar? A new icon has appeared on the Windows 10 taskbar. I'll review what it is and how to make it go away. One of the easiest ways to determine if your Windows 10 machine has been updated to the “Fall Creators Update” is the appearance of a new icon to the immediate left of the notification area of the Windows taskbar. Hover your mouse pointer over it, and you’ll see it’s labeled “People”. It’s a new feature in Windows 10. My sense is it’s somewhat half-baked, and ultimately more annoying than useful. But perhaps that’s just me. The idea is this: you can pin an icon for a contact to your taskbar. Presumably, you’d do this for a contact with whom you interact frequently. As we’ll see below, it makes contacting them somewhat easier. 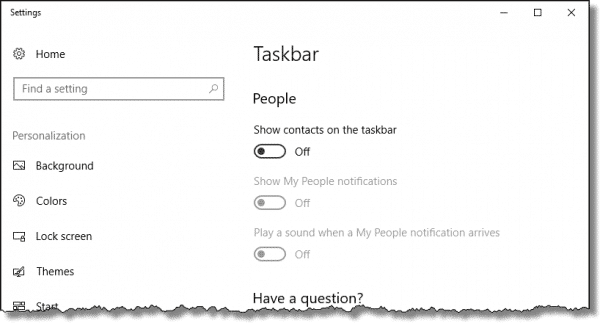 Click on the People icon in your taskbar and you’ll be shown a list of suggested contacts you might be interested in pinning to the taskbar. You’ll be shown information about the contact. The contact will be added as an icon on your taskbar. Now, whenever you click on that icon in the taskbar, this contact information window will pop up. The items in that information window are somewhat useful. Clicking on the phone currently seems to do nothing. Clicking on the email address launches your default email program with a new message to this contact opened. 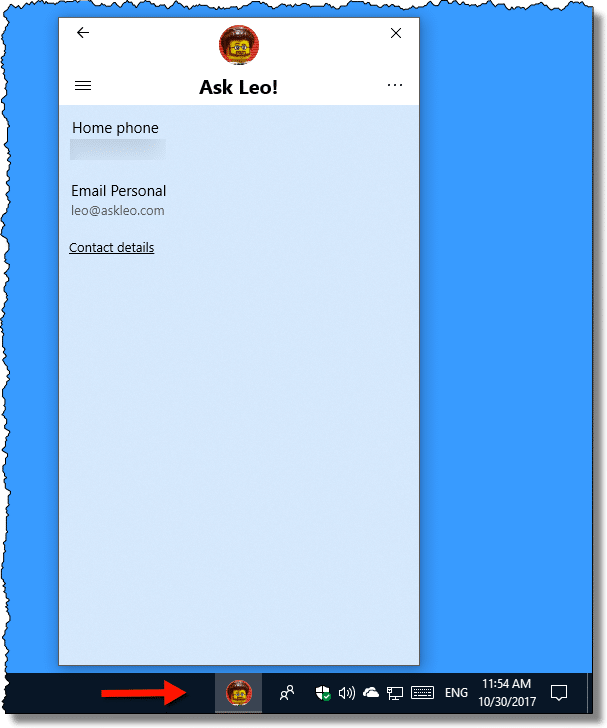 Clicking on contact details displays more information about the contact, with controls to pin or unpin the contact from the Start menu or taskbar, edit the contact information, and more. The most interesting view, however, is when you click on what looks like a back-arrow at the top of the window. This displays a tiled set of apps with which this contact is linked. Typically, that includes the People app, the Mail app, and Skype. These tiles appear to be more useful. People: returns to the contact information page. Skype: opens Skype within the pop-up window, with the various contact options available for that specific contact. There’s probably more, but I have to say the interface feels confusing, and as I said above, half-baked. 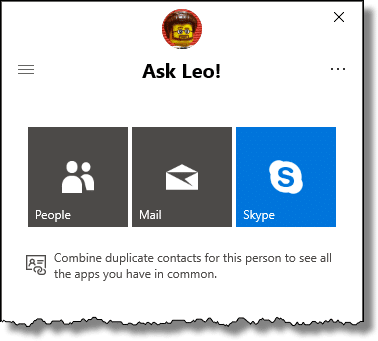 Repeated calls to “combine duplicate contacts” that have already been combined (information for the same contact across multiple applications is linked or merged) is just one example. In my opinion, it’s not ready for prime-time, so I’m ready to have it go away. Right-click on an empty area of the taskbar. In the resulting pop-up menu, make sure that “Show People button” is unchecked. That’s really all that’s necessary. If you like, you’ll find some additional settings in the Settings app. Click the Start menu and search for “Taskbar settings”. Scroll to the bottom of the resulting app page, and you’ll find the setting to control the People button’s presence, as well as a couple of notification options. How Do I Make the Windows 10 Offer Icon Go Away? - Two techniques to remove the Windows 10 offer icon, including a more generally useful approach to notification icons. How Do I Make the Taskbar Smaller or Larger? - It's easy to make the Windows taskbar smaller or larger - perhaps too easy, since it can happen by accident. I'll show you how to change it and how to lock it. How can people be signed into both Skype and Microsoft Messenger at the same time? - Until the migration from IM to Skype is complete, I think it's likely to see both accounts for many friends. It’s simply that Skype, the program, is logging into the both Skype and Microsoft Messenger at the same time. How to Manage Taskbar Space - The Windows taskbar is a very flexible piece of screen real estate. There are many things about it you can change to adjust taskbar space. 1: You could export from the other program or account, and then import into your Microsoft account, but you’d still be maintaining two separate sets of contacts. The latest iteration of windows 10 hasn’t gotten to my computer yet so I can’t tell for sure what this is. Could it be related to the people app that first appeared in windows 8 and is only available if you sign into your computer with a Microsoft account? (I understand there are also other apps that are only available from a Microsoft account although I don’t know what these other apps are off hand). Anyway, I always sign in with a Microsoft account and have been using the People app since it first appeared on my computer. Most of the entries are my wife’s since she has many more contacts. You can store anything there including your Christmas Card list, your friends, relatives, coworkers, businesses you work with, geneology, anything. The entries appear in my hotmail account. I’ve eliminated the contacts from my other mail accounts and use the people app exclusively. Anyway what I wanted to convey is that it is very useful at least to me. If you sign in with a local account then you might be missing something useful. 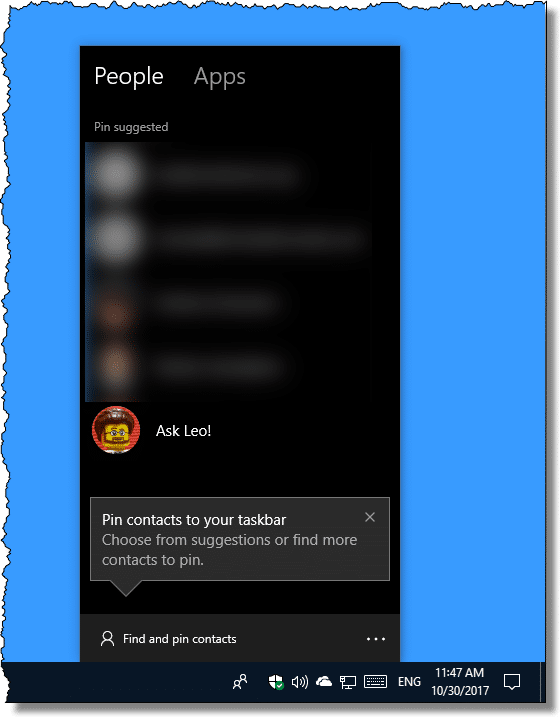 You could probably do the same thing by pinning the People app to the task bar, but Microsoft has already done it for you. You’ve said You’ve eliminated contacts from other accounts. Do you have your Hotmail contacts backed up? i’m sorry, but this is just more useless bloat from MickeySoft. They appear to be using the ” build it, and they will come ” style of adding ” features “. I like Windows 10, but come on, quit adding childish ” features “. I don’t want anything to do with this new taskbar i’m seventy years old and don’t need any of this bloody nonsense.